First the maintenance, then the storms, and if that wasn’t enough, there was also a fire on Borwin alpha. The worldwide first high-voltage DC converter for an offshore wind farm was out of operation for several months. First of all, Borwin alpha was scheduled to be switched off for maintenance work by TenneT on 17 October 2013. However, the socket only came back into operation on 5 January 2014. “Maintenance got significantly delayed, as the scaffolding on the platform had to be taken down again due to several storms. “Safety takes absolute priority with us,” says Henrike Lau, press officer at TenneT. On 23 March, there was also a technical defect. “A capacitator had burnt out, and the fire had severely contaminated the utility room. This has to be cleaned thoroughly first,” says Lau. According to Tennet, cleaning is to be completed by the second week in May. The capacitator is expected to be ready for use again then. The outage also means several months of standstill for the connected wind farms. The most affected was the German North Sea wind park Bard Offshore 1. The power plant built by the Bard Group which is currently undergoing liquidation, with 80 machines and 400 MW connected load, was not able to feed into the grid for several months. Global Tech 1 was also affected by the outage. 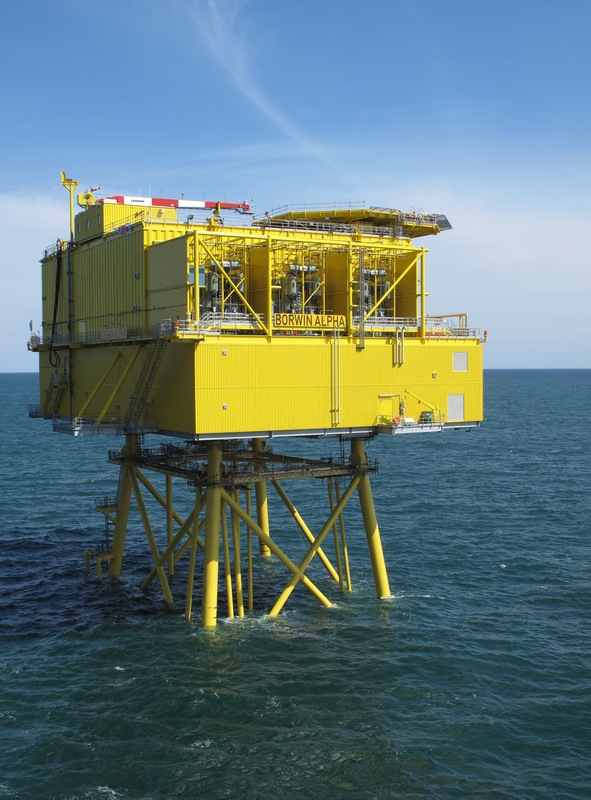 As the HVDC converter is not yet working for this offshore wind park, the operators of Global Tech 1 can use the free transmission capacity of the neighbouring platform Borwin alpha. Usually, TenneT is only allowed to take the platform out of operation for ten calendar days, according to the German Energy Economy Act. From the eleventh day of maintenance, the connected operators are entitled to compensation. Under applicable law, this adds up to 90% of the lost revenue. In compliance with the same set of rules, Tennet can transfer a large proportion of the costs to the power customers, as long as the company cannot be accused of negligence or intent. The €400 million converter station was supplied by ABB AG in 2009. Since then, it has connected Bard Offshore 1 with the mainland by way of a 120 km long high-voltage DC transmission line (HVDC). Customer of the world premiere for low-loss power transmission was Transpower, then a subsidiary of Eon, which was taken over in 2010 by TenneT. During peak days in March, Bard Offshore 1 produced up to 417 MW. During the shut-offs, the systems were supplied with power via the diesel generator of the windfarm-internal transformer platform to sustain all functions. “Compared to TenneT, we must prove operational readiness of every single wind energy plant,” says Richard Schmidt Obermöller, deputy technical director of Offshore Wind Solutions GmbH, which manages the wind farm. The incidence shows the amounts that depend on the operability of the sockets at sea. This is why the converter stations are handled with great care. Apart from a ship collision, fires represent the largest risk of failure, which are very hard to insure due to the high costs. This is also true for the windfarm-internal power collectors. Experts of the new research consortium Flare (Research, Development, Design and Education for Fire Safety in Unique Environments) estimate that the outage of a transformer due to a fire can last between 24 and 30 months and cost some hundred million Euro. For this reason, Flare wants to minimise the disproportionate fire risks with adapted technical solutions. In addition to the Danish companies TSO and Energienet.dk, leading institutions in the field of fire protection safety are also part of the research consortium. This might result in a standard for the industry with uniform codes.